Etnobird is a nicely designed wild bird feeder that takes photos of birds, counts and feeds them. All feeder activity is instantly viewable in Android and iOS mobile apps, where You can share photos with friends and identify bird species visiting the feeder. All Etnobird feeders are connected to global network, which makes possible to see which birds are visiting their own, neighbour's or any other Etnobird feeder in e.g. Japan, United Kingdom or Canada. Etnobird is currently in development. Sign up for being the first one to be informed about presales opening. See how many birds visit feeder on hourly, daily and monthly basis. See handy graphs in your computer and mobile. Feeder has a compact nice looking design, that makes it a wonderful accessory for your garden or backyard. Feeder is available both in environmentaly friendly plywood and durable plexi-glass housing. Photos are taken automatically, when bird visits feeder. Bird photos have wonderful quality that allows easily to see the birds in amazing details and makes them suitable for amazing Instagram and Facebook posts. Seeds are automatically put to feeding area. You will get a notification to your mobile, if seeds are running out in feeder. Feeder connects to internet via WiFi. WiFi extenders are available as an accessory. It means that you do not need to worry about any wiring. Mobile app notifies you instantly, when birds are visiting your feeder. You can see photos and species of birds directly in your smart phone. Mobile apps are available for both Android and iOS. Feeder has powerful battery that assures its operation without any cabling. Charging is easy via USB cable. Order two batteries to keep you feeder running even when one battery is charging. Feeder has a smart sensor, which detects and counts visiting birds. Integrated microcontroller and a photo camera allow to monitor all feeder activity directly from your mobile phone. Powerful battery pack assures long operation without charging. Feeders are connected to the Internet via WiFi or GSM connection and belong to world-wide feeder network that allows you see which birds visit feeders, for example, in Germany, Japan or Canada. Heigo knows everything about building durable electronics devices. He is also promoting the feeder in every imaginable time moment. Tanel has extensive experience in project management and software development. He takes care of web server and mobile development. Marek is programming microcontrollers and embedded systems. He will assure that bird data is gathered in feeder. Ago is a professional in embedded systems and image recognition software development. He makes sure that bird data reaches feeder users. Riina does beautiful and functional user interfaces. Your user experience in Etnobird's mobile apps and web page is at Riina's hands. 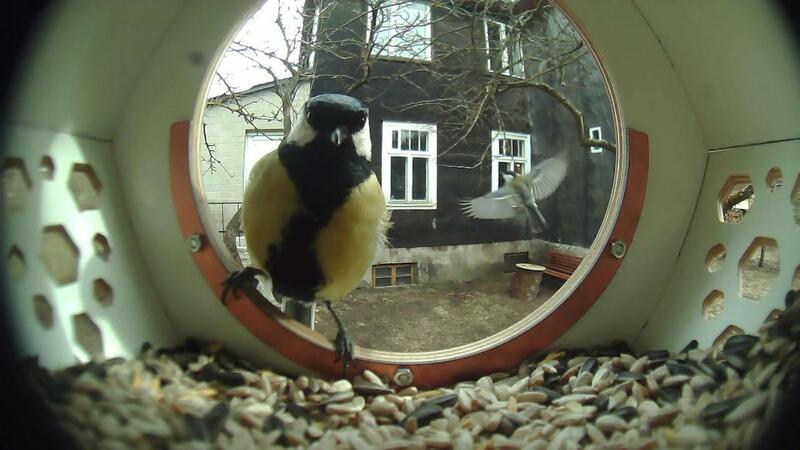 Between 16.03.2015 and 30.04.2015 European Regional Development Fund co-financed the project "Product design creation for Etnobird smart bird feeder". The project received support from the innovation voucher EAS support measure.